Monday March 24th 1879 It was somewhat pleasanter this morning and we began home cleaning in earnest. We had Mr Baileys room ready for him before noon. In the afternoon I cleaned the garret and Hatt the room down stairs. I was very tired but worked on my tidy all the evening. We hear Win is worse. A letter from Mrs Dennison. 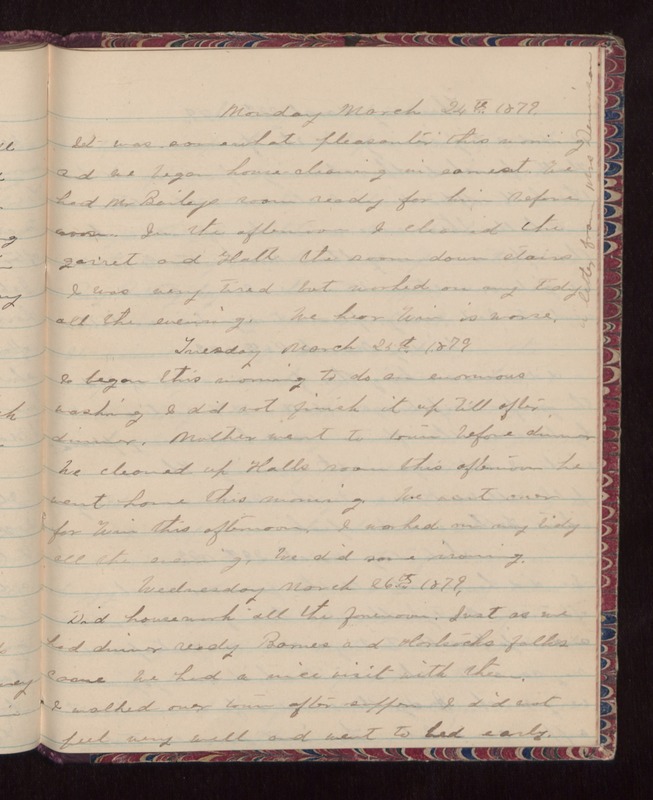 Tuesday March 24th 1879 I began this morning to do an enormous washing. I did not finish it up till after dinner. Mother went to town before dinner. We cleaned up Hatts room this afternoon he went home this morning. We went over for Win this afternoon. I worked on my tidy all the evening. We did some ironing. Wednesday March 26th 1879 Did housework all the forenoon. Just as we had dinner ready Barnes and Hartsocks folks came. We had a nice visit with them. I walked over town after supper I did not feel very well and went to bed early.